Still not sure what you want to be for Halloween? Maybe you know that you want to be a classic Halloween character, but you are not sure how to get the look. Well, you have come to the right place my friend! 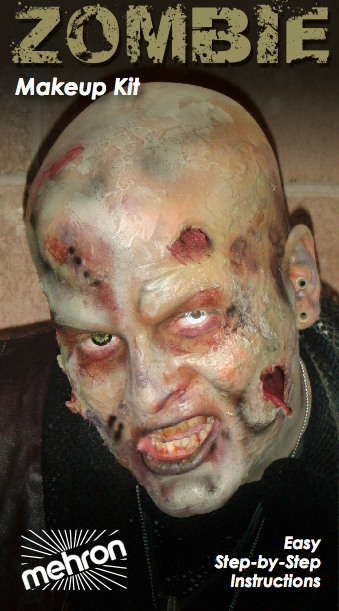 There are lots of Halloween character makeups on Mehron’s Get the Looks; Step-by-Step web page. It’s a collection of classic Halloween characters with step by step instructions (including pictures) on how to create that particular look with Mehron products. Select from a variety of looks like Modern Vampire, Werewolf, Zombie, Witch, Blue Character (Blue Man Group makeup), Goth, Skeleton and more. You can download the instructions without purchasing the makeup kit. Which is great if you just want to take a gander to get a few ideas. However, each kit provides all the products and tools needed for the look you purchased. This can save you the time and energy of running around piecemealing your look together. Is it worth the $$? The kits vary in price range from about $15.95 up to $34.95. As you can see in the Zombie kit, pictured below, you get a lot for your money (click here to see the how-to). You don’t just get the makeup colors. Each kit is specific to the character, like the Werewolf kit comes with crepe hair and the Modern Vampire kit has products and instructions on subtle veining effects. The Goth kit comes with a tongue stud (that is applied with a suction cup) and a spring-loaded ring you can wear on your nose, eyebrow or lip. These are all fun details that make the kits worth worthwhile. On top of all that, Mehron cosmetics are professional grade products that are made for use on stage, film and television. However, if you just want the makeup with out the accessories or instruction, check out their Tri-Color-Palette line which retails for about $7.95.